These are gross and scary and I doubt I'd be able to perform a patronus charm when I met one because I'd be a goner before I'd pull my want. I hope we get to learn a patronus on Pottermore and so on, and I want to have one, but meeting one for real would render me useless. They are terrifying! A three-headed dog and a giant spider seem lovely at the moment. The fact that Harry faced death and still was more afraid of dementors really impressed me as a kid! I loved how Lupin explained it though, of Harry being afraid of fear itself. Such deep books man! I was worried they wouldn't be able to get them right in the movies and then I saw them and just went, nope, they got them alright! Great choice :) I chose the Basilisk! 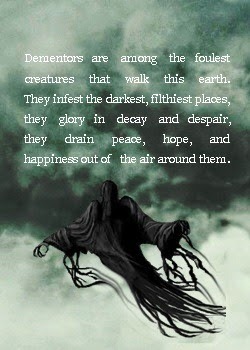 Dementors seem to be quite a popular choice, and I can understand why! They freak me out too. They're more than physically threatening, they're wholly threatening. Good choice of visuals! I think I could deal with a Boggart, because it's dealing with your fear and that is something I can handle eventually. 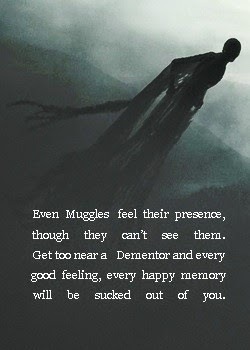 But the feeling a Dementor would give me.. just look at all those people in Azkaban, who get insane by their presence. No thanks! These hideous things are the absolute worst! To be left with no hope and only your worst memories, or should I say nightmares- *shiver* Hmm...I think I'd rather hug a Blast-Ended Skrewt than face a Dementor! 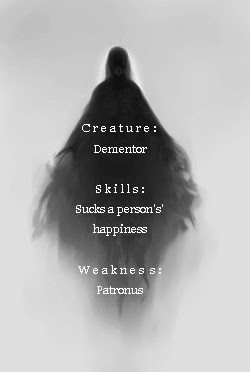 The fact that his boggart was a dementor is really telling. Some things are worse than death to him apparently and reliving his worst moments over and over again as well as losing all happiness is what did it. 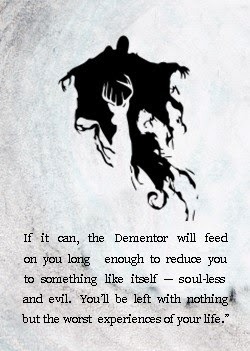 Dementors are truly terrifying. Excellent pick :D Jaclyn @ JC's Book Haven. An Ode to Harry Potter, the Character.